Net Worth Update (December 2017) — Future Proof M.D. My apologies for the delay in posting over the holidays. 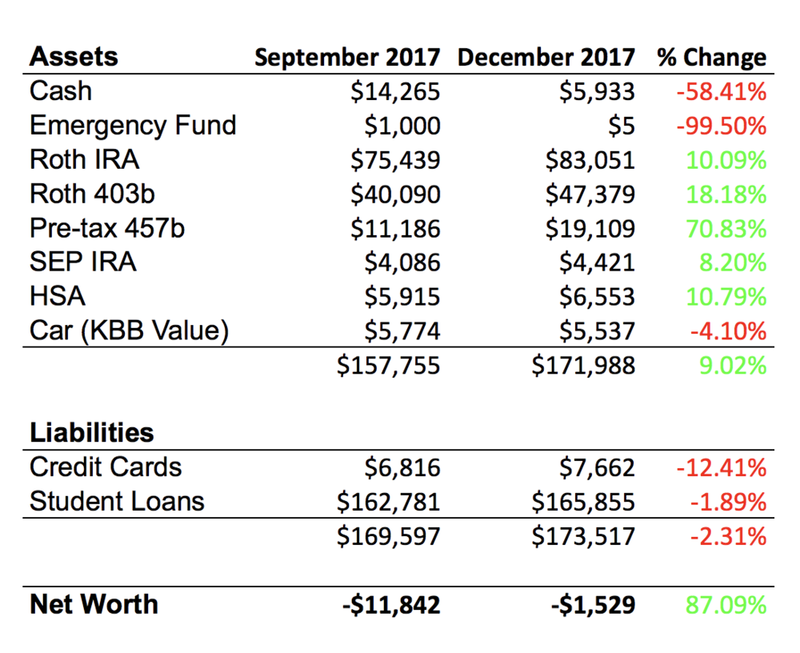 Welcome to the December 2017 edition of the FPMD Net Worth Update - a quarterly post where I put my money where my mouth is and tell you all about how I manage my finances. Over time, it has become the most popular series on FPMD. I talk the talk, but do I walk the walk? You be the judge. Here is what I've been up to for the last 3 months. Cash - A lot happened in the last 3 months. I will explain further in an upcoming post but the CliffsNotes version is that I spent quite a bit of $$$$. Decreasing cash drag was something I've been trying to achieve for some time now, but admittedly this was not the way I planned to do it. Emergency Fund - Unfortunately I had to dip into my emergency fund for some of the expenses I incurred over the last 3 months. However, I plan to start building it back up in the new year. Roth IRA - The bull market continues on a nice pace, with the S&P 500 gaining a whopping 19.42% in 2017. As the saying goes - "a rising tide floats all boats". My Roth IRA investments have been seeing a lot of red, gaining 23.4% in 2017. Roth 403(b) - Steady growth here as well. I had to adjust the contribution amount on my final paycheck in order to maximize my contributions for 2017, but I did it! $18,000 invested! Pre-tax 457(b) - I had planned to max out my 2017 contributions at $18,000. But I miscalculated by one paycheck when I set the whole thing up. Despite trying to correct this by withholding 100% of my final paycheck of 2017, I still fell short with $17,910. SEP IRA - Given increased expenses in my personal life, I am currently not planning to contribute to my SEP IRA. As to why I started an SEP IRA, check out this post. Health Savings Account (HSA) - I managed to max out the annual contribution limit of $3,400 from paycheck deductions. While initially intended purely to be an alternative retirement account, I recently had to withdrawal from the account for healthcare expenses. If you are curious why I switched from a traditional medical plan to an HSA, see my previous posts here and here for the benefits of an HSA. Car - At this point, I intend to drive my trusty 2009 Honda Fit until it dies or my Tesla Model 3 is delivered, whichever one arrives sooner. I'm really hoping it's the latter rather than the former. Credit Cards - My credit card spending went up in the last quarter due to increased personal expenses. But I plan to have it under control again as soon as possible. My favorite credit card is still the Chase Sapphire Reserve. For a list of my most frequently used credit cards, see Future Proof Toolkit - My Favorite Credit Cards. Student Loans - I'm currently making income-based payments on the REPAYE plan. See why I Switched to REPAYE and I Like It. My overall goal remains unchanged with the intention of qualifying for Public Service Loan Forgiveness (PSLF). 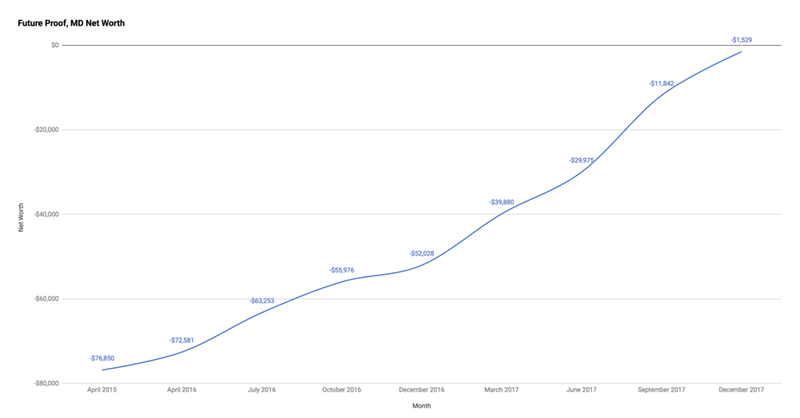 The last quarter of 2017 saw a whopping 87.1% increase in my net worth! Of course when the denominator is such a small number, even a meager change can lead to a significant percentage increase. See that horizontal line toward the top of the chart? That's the Net Worth Zero line! I intend to cross that line into positive net worth territory by the next Net Worth Update. Another financial goal I had set for myself was to have at least $150,000 in investments by the time I finish residency. I am proud to report I met that goal in the last quarter. Of course, these numbers can change drastically from one update to the next depending on how the market performs. But for now, I'm going to take an imaginary celebratory lap. Looking forward to 2018, I anticipate increased personal expenses in the near future. Combined with a pay cut coming in July of 2018 (the inability to moonlight in IR fellowship will lead to a defacto pay cut for the second half of the year), it would be very unlikely for me to max out all of the tax-advantaged accounts in 2018 as I did in 2017. I will be adjusting my PYSF strategy to reflect that change in the near future. Contract Diagnostics is the country’s only firm 100% dedicated to Physician Contract Reviews. Their proprietary review process focuses around educating their Physician clients on how to negotiate and ask for things, what specifically to ask for, and an overall view of the ‘deal’. Not a law firm, they provide overall ‘deal’ advice in a much more comprehensive manner than a traditional lawyer would. While their attorneys review every contract, it is presented in a much different way based on your specific situation. Private Practice vs Hospital employed? Hospitalist vs Trauma Surgeon? California vs Florida…they are familiar with all the nuances of each specific situation and would love to help with yours.